This animal was announced over the summer, along with 2 large sauropods. Since it's the first good theropod remains from down under they named the beastie Autralovenator. I finally got around to drawing it, and a good thing I waited so long. 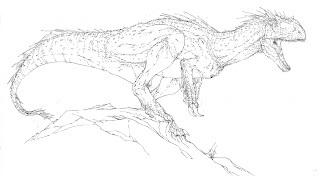 Last week a new paper was published that finally (for now at least) sheds some light on a new group of theropods The Neovenatoridea. This appears to be a second group of allosaurs, the sister group of the Carchadontosaurs, and in this group is Australovenator and drum roll please.... Megaraptor. 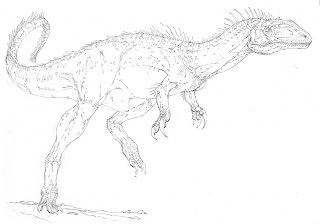 So Megaraptor isn't a Spinosaur or a Carcharadontosaur but a really advanced allosaur. I'm still geeking about this! More later, including a new giant Tyrannosaur.. oooohhhh! look... he is screaming... colour me, Brett!!! the rest, fantastic... as always!